Couvin (French pronunciation: ​[ku.vɛ̃]; Walloon: Couvén) is a Walloon municipality located in the Belgian province of Namur. On 1 January 2006 the municipality had 13,476 inhabitants. 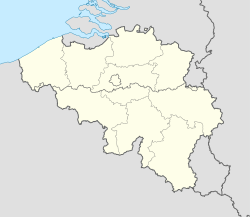 Couvin is the second largest municipality of Belgium by surface area, after Tournai. The total area is 206.93 km², giving a population density of 65 inhabitants per km². The municipality consists of the following sub-municipalities: Couvin proper, Aublain, Boussu-en-Fagne, Brûly, Brûly-de-Pesche, Cul-des-Sarts, Dailly, Frasnes-lez-Couvin, Gonrieux, Mariembourg, Pesche, Petigny, Petite-Chapelle, and Presgaux. Couvin railway station provides the town with a rail link direct to Charleroi. The line terminates here; the next station is Mariembourg. There are a number of sites of interest to tourists in the municipality. One end of the Chemin de Fer à vapeur des Trois Vallées heritage railway is at Mariembourg. The Brasserie des Fagnes brewery is also situated there. Caves in the area include the Trou de l’Abîme and the Neptune Caves. Wolfsschlucht I, known locally as "Hitler's Bunker", is located at Brûly-de-Pesche. It was used as one of Adolf Hitler's military headquarters during the Battle of France.